Cover Delays Drying and Prevents Spills! White plastic tray with 10 wells. Plus a large center well. These are great for any art room. These are great for saving paint. The lids are what makes this product worth it. I bought these for my kids thinking I would not have to clean up/put paint away immediately. These are great! 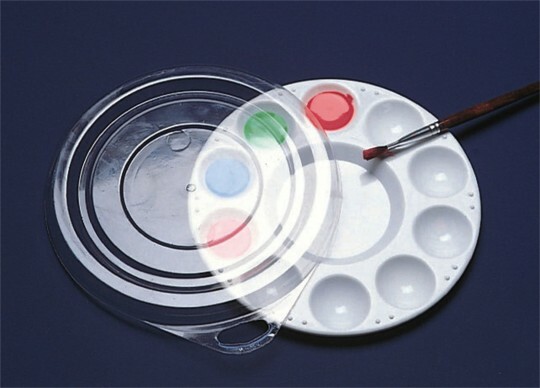 They are easy to clean and my 2 small kids 4 and 6 use them with acrylic paints. They have space to mix colors. I haven't really used the covers but I like having them!! The lid stays on and is easy to snap on! Nice little palette with decently deep wells for the paints. Just be aware that the lid is super thin plastic that could tear up easily but the palette itself is great.